In medium bowl, combine broccoli, onions, tomato and salad dressing; mix well. 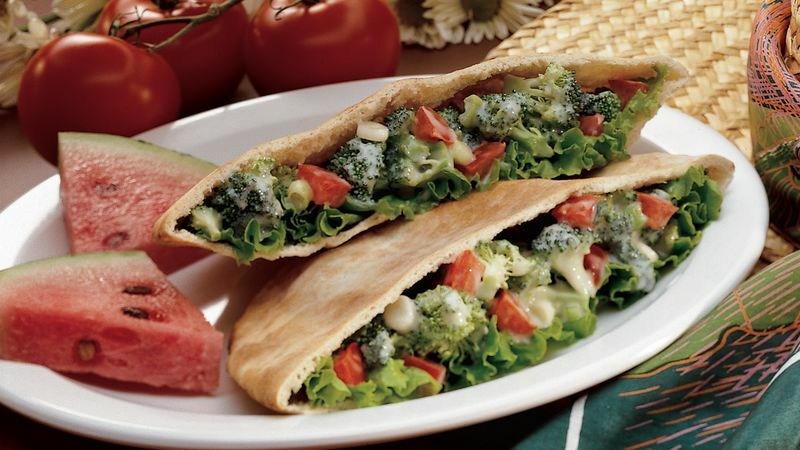 Line each pita bread half with lettuce. Fill each with about 2/3 cup salad mixture. These sandwiches are made from just the broccoli florets; look in the produce section or salad bar of the supermarket for broccoli florets sold by the pound. If you buy broccoli stalks, don’t throw away the sweet-tasting stems; peel and slice them into long pieces to eat like carrot or celery sticks. For another version of this sandwich, add 2 tablespoons each of golden raisins and shelled sunflower nuts to the broccoli mixture.